Take your students to another level by providing downwind & distance paddling instruction sessions. 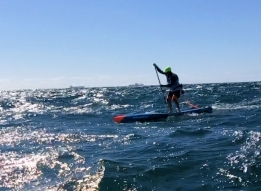 Downwind paddling utilises ocean / lake swells and wind to advantage on special SUP boards. You’ll learn how to organise and conduct downwind and distance paddling sessions up to 10 kms (6 miles), and safely manage clients. Plan, conduct, instruct and safely manage students for stand up paddle downwind and distance paddling sessions, up to 10km (6 miles). Downwind paddling locations are characterised by the wind behind, speed 12 to 20 knots, swell size between 2ft to 4ft, no more than 700 metres (765 yards) from shore. Stand Up Paddle Instructor in the SUP or outdoor recreation industry. Hold ASI Level 2 Stand Up Paddle Instructor (Exposed Waters) certificate. This intensive 2 day workshop will focus on completing the major components of the course. Some additional homework is also required to complete assessments and gain practical on-the-job instruction experience. Ideal for: students who want to cover theory components in an intensive format. Complete 10 km downwind SUP paddles, in swell up to 2 - 4ft. Demonstrate downwind SUP skill and knowledge including: effectively maintaining momentum, catch and ride “bumps”, correct paddling technique, varying stroke rate and length, power up and power down, effectively conserving energy, wipe-out safely at speed, SUP etiquette and rights of way. Prepare 3 x written logistics reports for completing a 10 km (6 mile) downwind paddle session, including submitting 3 x video evidence demonstrating correct technique. Provide a Senior First Aid Certificate (no more than 3 years old). Provide a copy of a 'Surf' Rescue Award certificate. If you are not able to demonstrate competent downwind paddling skills at the workshop, one additional video assessment can be submitted for free. Plus post workshop assessment & practical hours work experience. ASI also issues education department approved training certificates. These do not expire. ASI is an Australian Registered Training Organisation (RTO) with authority to issue NRT certificates. The following certificate is issued to students undertaking training in Australia.